The use of CT colonography (CTC) as both a diagnostic and screening examination for colon cancer is steadily increasing. It also is valuable as a prognostic tool for patients recovering from acute diverticulitis, according to radiologists at the Università degli Studi di Milano in Italy. At the Azienda Ospedaliera San Paolo University hospital in Milan, a CTC is ordered for recovering patients about two months following an episode of acute diverticulitis. 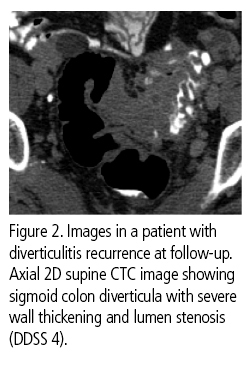 CTC provides a detailed map of the extent of diverticular disease and the number of diverticula. It provides detailed information on post-acute involvement of colonic segments and allows for the diagnosis of complications such as diverticular stricture or fistula that may require surgical treatment. Because active inflammation during acute diverticulitis can obscure important coexisting disease such as colorectal cancer, it is important to subsequently verify if other conditions exist. Flor and colleagues subsequently conducted a study published online October 5, 2015 in Academic Radiology to assess the prognostic value of CTC in patients recovering after acute diverticulitis and to evaluate the clinical relevance of any additional information gained from CTC. Forty-six patients admitted to the emergency department of the Azienda Ospedaliera San Paolo between March 2010 and December 2013 were included in the study cohort. A follow-up CTC had been performed between four and 36 weeks following initial treatment for acute diverticulitis of the left colon. The scan was performed in supine and prone positions, and 59% of the patients had an additional lateral decubitus scan to ameliorate sigmoid colon distension. For the study, a radiologist retrospectively analyzed the abdominal CT and the CTC examinations for each patient, calculating the severity of disease with a modified Hinchey classification and DDSS. The authors reported that all the DDSS measurements were taken on two-dimensional multiplanar reformatted images from the best distended series using standard soft-tissue windowing. Nine percent of the patients had a DDSS 4 score, 15% with DDSS 3, 37% with DDSS2, and 39% with DDSS 1. Twenty-four percent were classified as having severe disease and 76% as having mild-moderate disease. By comparison, the Hinchley classification indicated that 33% had severe disease and 67% had mild-moderate disease. Forty percent of the patients underwent elective surgery after CTC for complications or recurrence of acute diverticulitis or sigmoid colon severe stenosis. The authors reported that a significant correlation was found between the probability of undergoing elective surgery and the CTC-based DDSS, whereas no correlation was found between this probability and the CT-based modified Hinchey classification. Moreover, CTC identified additional findings in five (11%) of the patients. These included an enterocolic fistula, an enterotubal fistula, and two cases of colon cancer. Notably, the abdominal CT scans of the two patients with colon cancer were negative. In conclusion, the authors recommend CTC as the test of choice in patients recovering from an episode of acute diverticulitis. Flor N, Rigamonti P, Ceretti AP, et al. Diverticular disease severity score based on CT colongraphy. 2013 Eur Radiol 23:2723-2729. Flor N, Maconi G, Sardanelli F, et al. Prognostic Value of the Diverticular Disease Severity Score Based on CT Colonography: Follow-up in Patients Recovering from Acute Diverticulitis. Acad Radiol. Published online October 5, 2015. 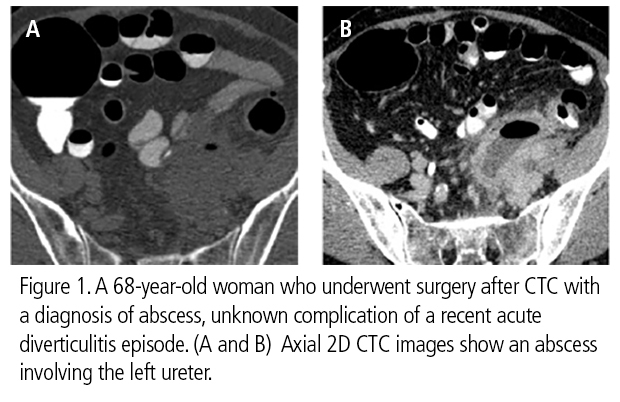 CT colonography recommended to follow patients after acute diverticulitis episode. Appl Radiol.